“Uberization” has become a popular descriptive moniker for the transformation of service work in the post-Recession era. The Uber model of taxi work, however, is only the latest in a series of neoliberal mutations in corporate and regulatory governance of the industry since the late 1970s. As with the Uber model, previous mutations have relied upon a discourse of worker “freedom” to make a moral case for the production of risk-laden work. Based on a decade of engaged ethnographic study of San Francisco’s taxi economy, I examine two pre-Uber shifts that generated earlier iterations of risk(y) work—the rise of long-term leasing and the commodification of medallions. What was the role of municipal government amidst these shifts, and what kinds of everyday experiences did they produce for drivers? My findings contrast with accounts of precarity theorized by and through deregulation. I argue that during both mutations, regulatory and judicial bodies played an active role in producing systems that—far from manufacturing freedom—subjugated workers into peonage. Veena Dubal is an Associate Professor of Law at the University of California, Hastings College of the Law where she teaches courses on work law and critical race theory. Professor Dubal’s research uses empirical methodologies to study the co-constitutive influences law, precarious work, and identity. Professor Dubal joined the Hastings Faculty in 2015, after a post-doctoral fellowship at Stanford University (also her undergraduate alma mater). Professor Dubal received her J.D. and Ph.D. from UC Berkeley. The topic of her doctoral research on San Francisco’s taxi industry arose out her years as a public interest attorney at the Asian Law Caucus where she founded a taxi worker project. 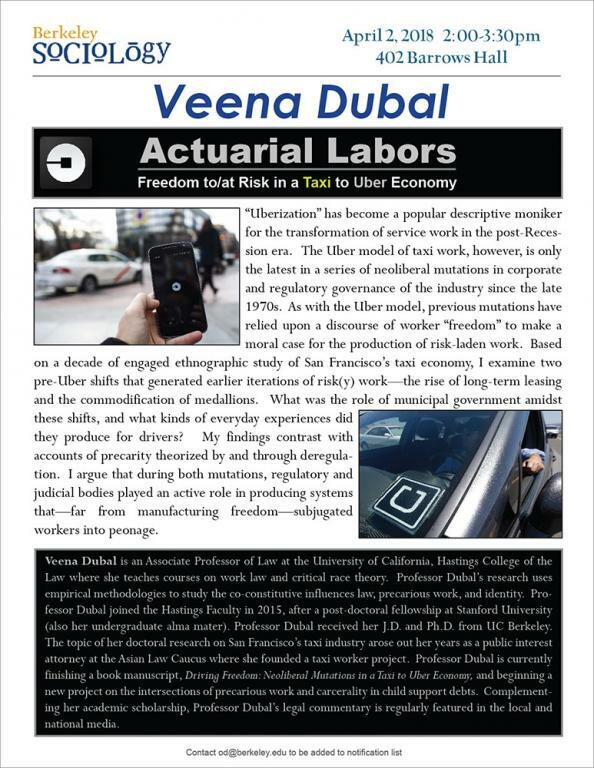 Professor Dubal is currently finishing a book manuscript, Driving Freedom: Neoliberal Mutations in a Taxi to Uber Economy, and beginning a new project on the intersections of precarious work and carcerality in child support debts. Complementing her academic scholarship, Professor Dubal’s legal commentary is regularly featured in the local and national media.